Hmm... looks like, Julochka and Bee, left me the keys, to their sweet place, over here... Lets talk food! Ox tail soup, red beans and rice, with huge shavings of coconut inside the pot,bubbling away, biscuits, dumplings, fried chicken, escovitch, beef patties and curried rice. I can still hear her shouting at me, not to run in the kitchen, while her pineapple cakes, were in the oven. It's no wonder, I grew up and became a chef. Cooking is deep inside my soul. No matter where I have cooked, or how fancy the restaurant I have worked, I adore food in in a simple form. Macaroni and tomato gravy, tomatoes and balsamic vinegar, baked yams topped with butter and fresh ground pepper, yellow cake with thick chocolate frosting. Thanks to Julochka and Bee, I am honored to be a guest in your kitchen. This apple crostata is easy. Don't feel you have to make your dough from scratch. Go to the store and purchase those refrigerator doughs, that come two in package- throw one on a lined baking sheet and stuff it full, with your apples and pile on the crumble mixture. It is delicious, this way. Either way, serve this warm and add a dollop of vanilla bean ice cream. Place flour, sugar, salt into food processor (use your steel blade) pulse a couple of times to combine. Add butter and toss quickly to coat each small cube of butter, with flour. Be careful of those blades. Pulse 25 more times, or until butter is size of peas. With the motor still running add 1/4 cup ice water through feed tube. Pulse a few more times to combine, but stop before dough comes together. Turn dough out to floured surface and roll out two disks. Seal separately in zip locks and refrigerate dough for at least an hour- or up to 2 days. You can freeze other disk, but I would bake 2 right away. Remember the filling is only to fill one disk. Roll pastry out to a 11 inch circle on floured surface. Place on baking sheet, lined with parchment. I used a silpat. OR~ purchase package of dough and skip this part! I dig that too! 1 1/2 pounds of apples (pick your favorites) I don't stick to just baking apples, I use a variety. Macintosh... whatever you like. Combine flour, sugar, salt, cinnamon and sprinkle of brown sugar, in bowl. Add the butter and cut with fork or whatever until mixture is crumbly. I always use fork ,but you can use food processor, if you like. Peel core and slice apples (thin slices). I like a combination of small chunks and slices. Toss your apples with that orange zest. Place apples in center of dough. leaving a 1 1/2 inch border. Gently fold the border over apples, making pleats as you created a circle, around your apples. You can brush edges with egg wash, but I don't. Bake for 20-25 minutes in 425 degree oven. Check after 10 minutes, if crust in browning too fast you can always place foil around edges. 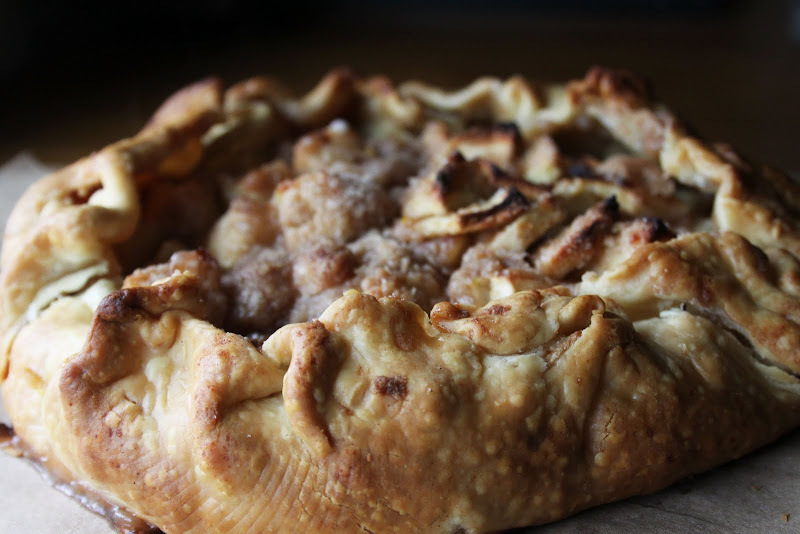 note from julochka & bee: a big thank you to christina for sharing her apple crostata here. please do check out her beautiful, big-hearted blog, soul aperture. this sounds divine and will most probably be gracing our table at some point over the weekend! Thanks! wonderful, poetic post, Christina! your musings on food made me hungry and I just ate a whole block of chocolate myself. ah that does sound really good :) someone should try it and let me know how it goes! im a newbie chef (wannabe haha) and this sounds so amazing! i have to say that i i made this the other day and i learned that it's really important to put the crust in the refrigerator as instructed. if you don't, it won't look very pretty. the other thing i did was rather sinful. i had caramelized a can of sweetened condensed milk according to eliane's instructions (http://scents-and-senses.blogspot.com/2009/10/huftgold-1-k-cal-pp.html) and so i had that caramel goodness just sitting there in the refrigerator (since i had restrained from eating more than a couple of spoonfuls). so i spread it on the crust before i put the apples in. so you might say it was a caramel apple crostata. and it was heaven. thank you so much christina for being our guest this week while i was galavanting around in istanbul! Christina makes everything she talks about sound like a symphony...and this is no exception. I love learning how she developed such a love of cooking, of good, simple food. It's evident that it was her grandmama's love that fed her soul...time spent with someone else's big heart allowed her own to grow. This was a joy to read!!! I made this and LOVE it. It's so my new favorite dessert!!! the next one I'm adding craisins, pecans and maybe even golden raisins to it to make a harvest type version of it. Thank you Christina for recommending this blog. Your corstata looks delicious! And it is the right season for apples, I see them everywhere here in France. This post leaves me yearning for baked apples - just the thought of the smell filling our home makes me swoon! Yum. My kind of rustic tart. Christina - I love hearing about your food memories. I think that people who grow up really relishing food (with all of its comforts and rituals and warmth) are blessed. I've already got the crostata on my menu for Saturday night. I have a few friends coming who really need some pampering, and we are going to have a meatball stew and your crostata. The only thing I would argue with you about is the pie crust: it's got to be homemade. I'm going to the apple festival in the mountains on Saturday and this looks like I should give it a try. THX! I just found you through Christina's blog, and oh my goodness, but I'm in love! What eye candy, and I can't wait to try some of these. I love a good rustic fruit tart: stone fruit in summer, apple in fall, and marmalade in winter. I hardly need more desserts to add to my "to bake, and soon!" list, but this one is going on it. I am fascinated by the idea of orange zest in lieu of lemon. came via Christina, your blog your pictures are super yummy! I struggle with pie crust because I am suspicious of vegetable shortening. I'm going to try the crostata with the apples we picked yesterday. I was tired and grumpy when my husband said "Let's go apple picking!" But it was a really quick fun outing and I'm so glad we did. And it is delicious! Laying the crust on a cookie sheet and crimping it around the filling seems easier somehow than maneuvering it correctly into a pie plate. I think a little salt is needed in the crust esp. if you use unsalted butter. Thanks!